Housed in the magnificent Bijloke Abbey, Ghent’s new city museum STAM opened to the public on October 9th 2010. STAM has its roots in the Ghent Heritage Forum and the former Museum of Antiquities, which displayed a rich but very fragmented collection of artefacts relating to the history of Ghent. After years of declining visitor numbers, the museum finally closed its doors in 2005. Meanwhile, ideas were taking shape for a brand-new museum that would showcase the history of Ghent in a way that would appeal to today’s public. Working with exhibition designers Tijdsbeeld & Pièce Montée, it was decided that unlike the old Museum of Antiquities, the contents of the new museum would be presented chronologically. But, whereas most museums start in the past and work their way forward, STAM starts in the modern-day city. Its motto is ‘from the present to the past and back again’. Where feasible and affordable, STAM believes in the selective use of multimedia, 3-D and other technologies to bring the story to life. When it came to marking the one-hundredth anniversary of the World Fair in Ghent, STAM decided to develop a virtual 3-D maquette of the exhibition buildings. A succession of world fairs were organized in Europe at the end of the nineteenth and the beginning of the twentieth centuries. In Belgium, world fairs had been staged in Brussels, Antwerp and Liège, and Ghent was determined not to be left out. 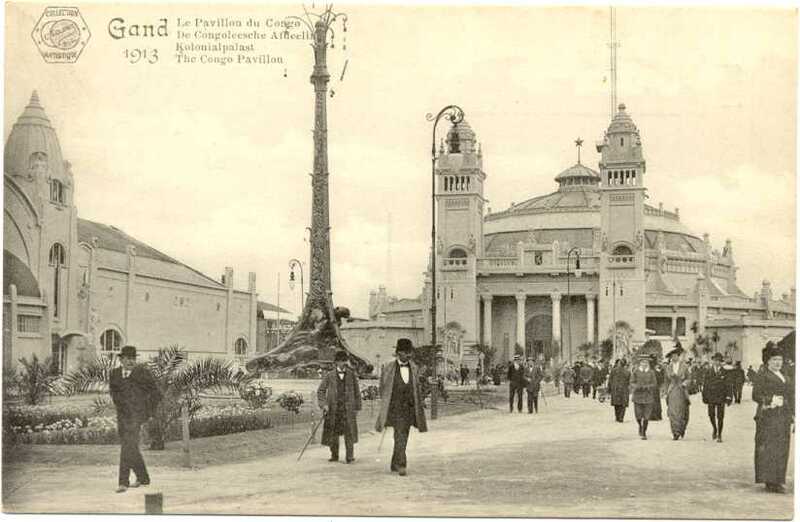 In particular the Liège exhibition of 1905 fuelled the ambitions of Ghent’s industrial bourgeoisie and they became the driving force behind the project. 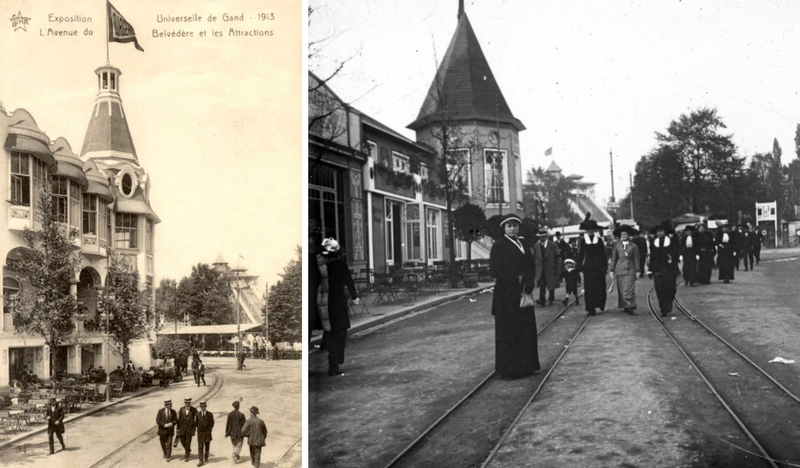 The 1913 World Fair was held on a 125-hectare area in Citadel Park and the Sint-Pietersaalst district. The exhibition was also a catalyst for the development of the city towards the south. The architect Oscar Van de Voorde (1871-1938) opted for a rather pompous style of building, with striking vistas. On April 26th 1913, the exhibition was opened by King Albert I and Queen Elisabeth of Belgium and the mayor of Ghent Emile Braun, even though it was far from ready, a strike for universal male suffrage having thrown a spanner in the works at the last moment. The exhibition site was not actually completed until early July, but this didn’t prevent over half a million people from visiting in the first week. Belgium presented itself as a leading industrial nation, a major manufacturer of machinery and railway equipment. World fair fixtures, such as historical reconstructions — in this case, Old Flanders — and the exotic rue du Caire, also made an appearance in Ghent. And then there was France. France’s rivalry with Germany escalated in the early twentieth century until it became an outright propaganda war in Belgium, which was also fought at world fairs. Furthermore, in 1913 the movement for the Dutchification of Ghent University was launched and this was an even greater incitement for Paris to flex its muscles. The French pavilions occupied an area of approximately 90,000 m². Yet the French offensive cannot really be described as a success. Not only were the pro-Flemish seriously antagonized, but several French-speaking personalities and commentators also felt that their southern neighbour had gone too far. The overwhelming French presence had caused the Germans to think long and hard about whether or not to participate. 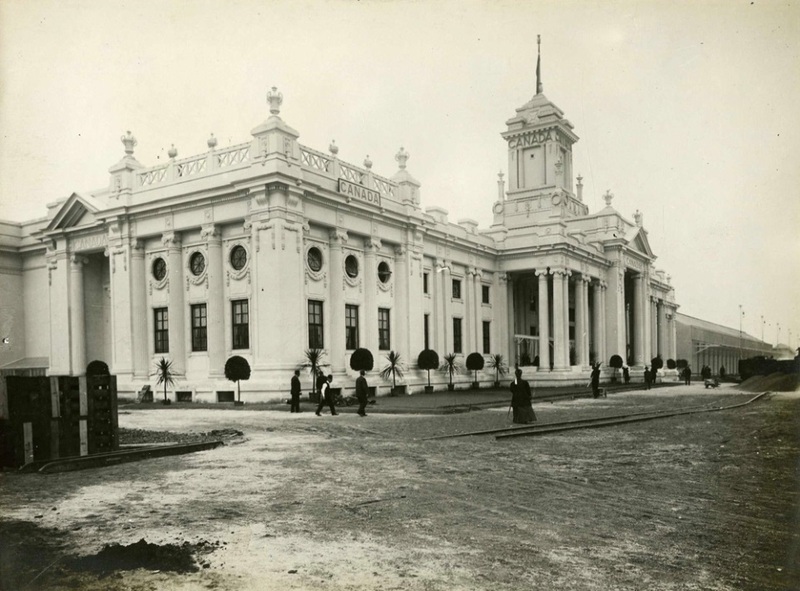 A group of German industrialists finally committed, and the remarkable German pavilion proved to be a textbook example of the New Objectivity. In 1908, the Independent Congo State, hitherto the private hunting grounds of Leopold II, was officially handed over to Belgium. The one-hectare Belgian Congo Pavilion at Ghent World Fair was meant to convince visitors — and international opinion — that Leopold II’s horrific practices were now at an end. The display of ‘exotic’ peoples in ‘human zoos’ was still an integral part of world fairs at the time and at the Ghent exhibition this manifested itself as a Senegalese and a Filipino village. The exhibition ended on November 3rd. The total number of visitors is unclear with estimates varying between 4 and 9 million. The Ghent World Fair was held in the area to the south of Gent-Sint-Pieters railway station. Another part of the exhibition grounds was located in Citadelpark, though little of that remains today. In Paris and Brussels, the Eiffel Tower and the Atomium are the respective reminders of world fairs, but in Ghent no such cynosure has survived, apart from two statues on the Paul de Smet de Naeyerplein, the central Erehof (Court of Honour) during the exhibition. The pompous exhibition halls situated around the square have all gone, but that is hardly surprising as they were all designed as temporary constructions to be demolished after the event. However imposing they may have looked, they were wood and metal structures ornamented with plaster and stucco. At the time the artificial stone known as ‘staff’ was frequently used for temporary buildings. There were even firms that went from exhibition site to exhibition site erecting halls. Not all the exhibition buildings have gone. In Citadelpark the City of Ghent had a stone Festival and Floral Hall built with a view to using it afterwards. However, two world wars, a fire and structural alterations mean that little remains today of the exterior of that earlier building. The large central hall, however, is the 1913 original. And it is still possible to visit the small school built in the World Fair’s ‘Modern Village’. This stone construction was demolished after the exhibition and reconstructed a few kilometres away. The building served as a school for several decades and is still there. However, these survivors are the exceptions. Most of the exhibition halls have gone, which means it isn’t always easy to visualize the scale of the exhibition. Photographs, postcards, posters, etc. provide a flavour of the event, but exactly what stood there and where those buildings were located is not always clear. Hence STAM decided to make a 3-D model of the exhibition grounds to mark the one-hundredth anniversary of Ghent World Fair. It would be a virtual maquette which allows you to walk round the exhibition and get a real feel for what it looked like. The availability of source material can make or break a 3-D reconstruction, but fortunately in the case of Ghent World Fair a substantial amount of material has been preserved. Both Ghent City Archive and Ghent University Library have well-documented sources. As well as financial records, contracts, posters, etc., they also have a wealth of plan views, construction drawings and photographs. When it comes to 3-D reconstructions, this material is of course indispensable. And, as luck would have it, much of it had already been digitized. The University Library’s entire World Fair collection, for example, can be consulted online. In the light of the centenary, Ghent City Archive also undertook to digitize some of its records relating to the World Fair. 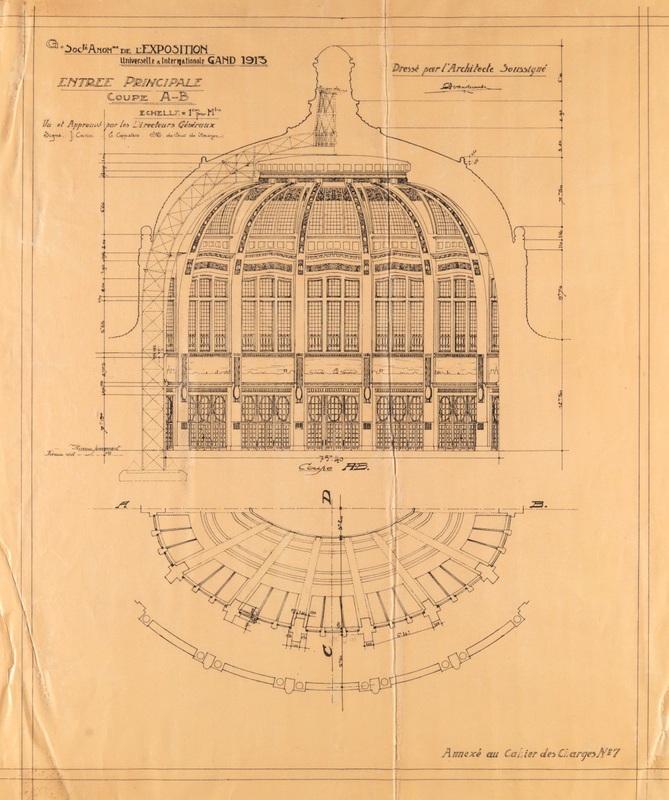 A total of more than 3,000 plans, photographs, sketches, maps, postcards, watercolours and construction drawings have been digitized and compared. STAM worked on this project with Mindscape3D, a company that specializes in 3-D applications, including historical projects. The preparatory work, such as examining and analyzing the records was carried out by the museum, while Mindscape3D drew the buildings and made the 3-D model. The first step was to locate the exhibition halls. 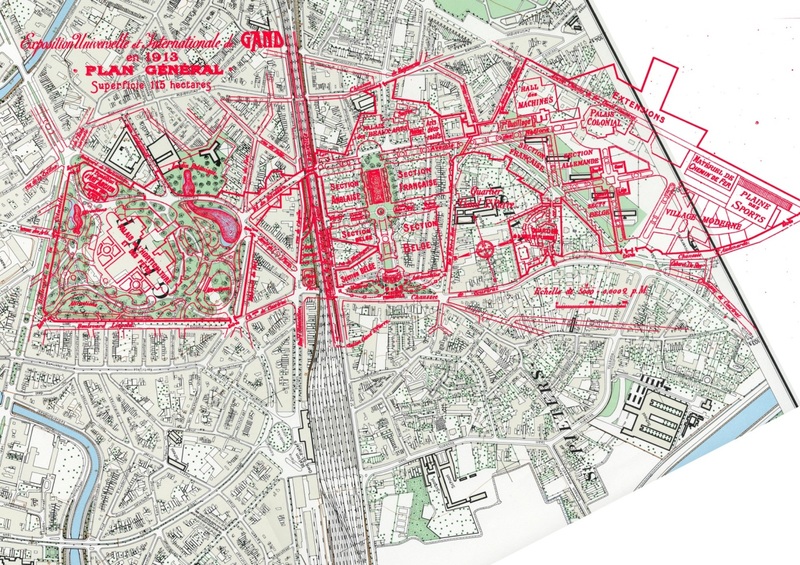 It proved possible to gauge with some accuracy where the buildings had stood by comparing historical and contemporary plans and maps. Once in position, the buildings were placed on a bed plate supplied by the City of Ghent’s 3-D unit. The bed plate also contains a digital elevation model so that any unevenness of the terrain could be incorporated into it. Moreover, the bed plate is geographically referenced, which means that the 3-D model of the World Fair can be included in future City of Ghent 3-D and GIS projects. At the next stage the exhibition halls were reconstructed one by one in 3-D. Where the plans were available, they obviously provided the basis for the 3-D model. Construction drawings with measurements and sections are of course extremely useful when making 3-D models. However, those plans were always compared to any available photographic material, for in some cases the building in the photograph differs from the original building plans. In that case the situation in the photograph was reconstructed as that was of course what was eventually built. Where no building plans were found, the exhibition halls were reconstructed from the photographs. In cases where a photograph shows an adjoining building or reference point whose measurements were known, the photograph served as a reference for the dimensional version. The more photographs there were available, the more detailed the buildings could be. The exhibition halls, the attractions in Citadelpark, ‘Old Flanders’ and the ‘Modern Village’ were all reconstructed from plans and photographs. Despite all the source material, not everything was rebuilt. The exhibition site also housed stalls selling food and drink, several bandstands, etc. They are marked on the plan view, but in many cases no suitable plans and other visual material were available for an adequate reconstruction. Stalls were nevertheless made drawing on the few photographs, and shading was used to indicate that it is a simplified reconstruction. Leaving out the stalls would have given a distorted picture, for the exhibition would have looked much emptier than it actually was. The 3-D model was also made in shades of grey rather than colour. While endeavouring to produce the best possible reconstruction, we nevertheless wanted to show that it is a simplification. So no colours but shades of grey were used, as if the 3-D model were a maquette. We encountered several problems while making the 3-D model. For example, on the corner of Belvédèrelaan there was a building known as the ‘Burgerhuis’ (Burghers’ House). When we placed several photographs side by side, we realized there was something about the tower of the building that didn’t tally. In some photographs there appeared to be another tower, not in exactly the same place. It was not entirely clear if there were one or two towers, but an examination of the records produced the explanation. Reports and plans have been preserved of all the seats of fire at the World Fair. They showed that there were several large fires, including one in the Burgerhuis. In his diary an eyewitness also describes how the Burgerhuis “fell prey to flames” shortly after it opened, but was rebuilt afterwards. So in one case the photograph shows the original tower and another shows the simplified tower reconstructed after the fire. The project has resulted in a virtual maquette containing the various exhibition halls. 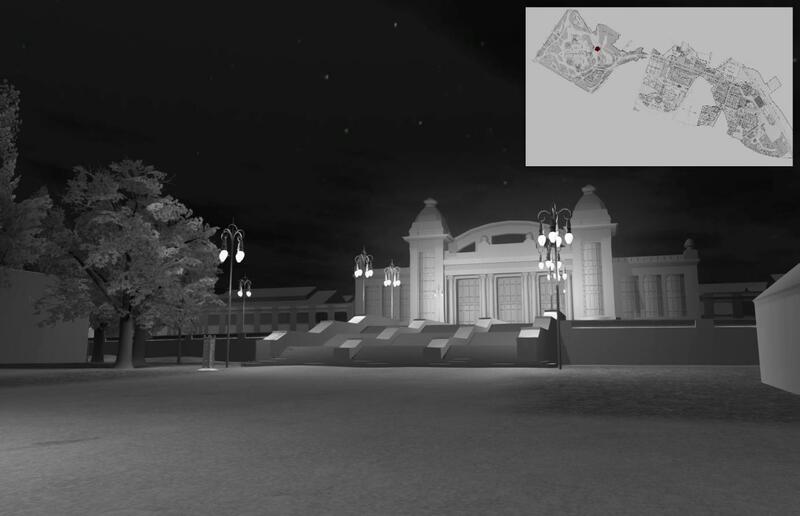 With the aid of a gamepad, users can walk round the exhibition grounds and admire the halls. They cannot go inside the halls, but there is an information column for each exhibition building. When that is selected, an explanation about the building pops up, along with visual material. Several photographs and postcards showing the interior of the exhibition halls have also been preserved and they are shown here. The text describes the historical context (e.g. the international balance of power) as well as what there was to see in the hall, any peculiarities such as the fire described above and the zeitgeist in 1913 (e.g. the Senegalese village). A ground plan always shows where the visitor is and can also be used to navigate quickly to another point. Ghent World Fair was one of the first to boast electric street lighting. Electricity was a relatively new technology at the time and it was promoted at these fairs. The photographs also show the lampposts and the archive was found to contain plans for the lighting and even drawings of light simulations. They were also used to make a night-time simulation of the World Fair. A number of projects were mounted in Ghent in 2013 to mark the centenary of Ghent World Fair. These included the 3-D model presented at STAM in the ‘Afterimages – Ives Maes’ exhibition. The Belgian artist Ives Maes travels the world taking photographs of any architectural remains of these world fairs and of the sites where they were held. Maes’ photographs might be described as ‘afterimages’, lingering vestiges of now fading dreams. The 3-D model of Ghent World Fair thus entered into a dialogue with afterimages of other exhibition sites. The Institute for Public History and the Department of Architecture & Urban Planning of the University of Ghent, Ghent City Archive, the Department for the Preservation of Monuments and Historic Buildings of the City of Ghent and STAM also joined forces to develop the www.gent1913virtueel.be website, a joint presentation platform which analyzes all aspects of the exhibition: its heritage, history and architecture. The 3-D model can be viewed on that website. The permanent presentation at STAM – Ghent city museum tells the story of Ghent through the ages. Until now it has only just touched upon the subject of the 1913 World Fair. However, in line with the museum’s policy of actively using multimedia to tell the story of Ghent, the virtual maquette has now been incorporated into the permanent exhibition. On a large LCD screen and with the aid of a gamepad visitors can admire a high-resolution version of the 3-D model which is supported by written information in four languages (Dutch, French, German and English). The World Fair held in Ghent at the beginning of the twentieth century is part of the city’s collective memory, but generally speaking far less is known about exactly when that exhibition took place, where it was held and what form it took. Well-documented records of the World Fair have been preserved, including building plans, postcards and photographs. 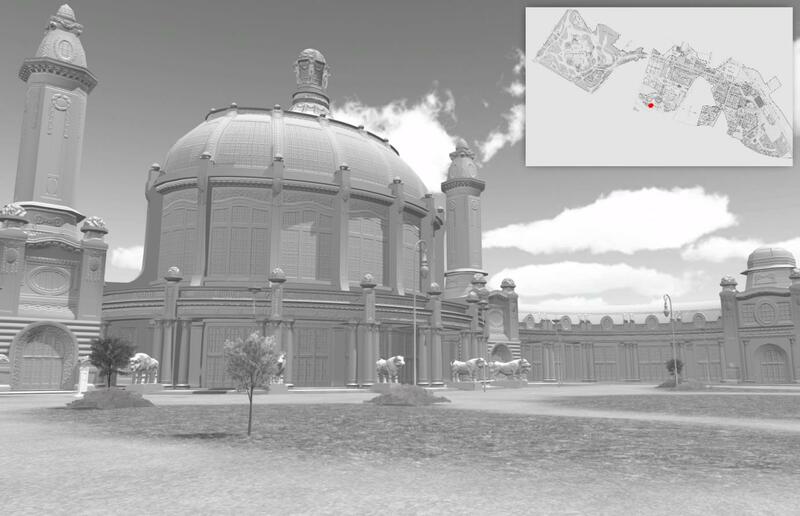 Drawing on this material, STAM worked with Mindscape3D to make a reconstruction of the World Fair. This virtual maquette gives users a complete overview of the size and scale of the World Fair as they walk round the exhibition grounds. André Capiteyn, Gent in weelde herboren: wereldtentoonstelling 1913, Ghent, City Archive, 1988, 227 pp. Wouter Van Acker, Christophe Verbruggen (ed. ), Gent 1913, op het breukvlak van de moderniteit, Ghent, Snoeck, 2013, 207 pp. 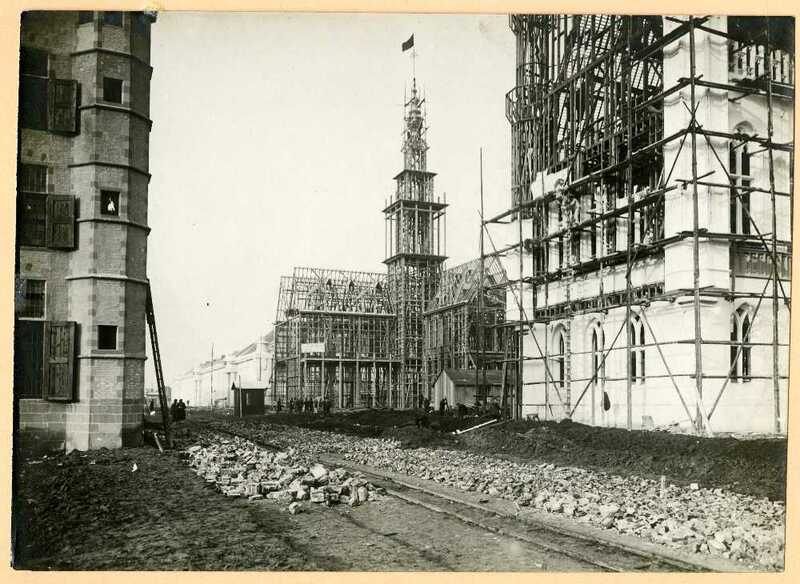 Beatrix Baillieul, Dirk Boncquet, André Capiteyn et al., Impact wereldtentoonstelling Gent 1913, Ghent, Dienst Monumentenzorg en Architectuur Stad Gent, 2013, 259 pp. Peter Jacobs, Erwin De Decker, Wandelen door Gent 1913-1918: van Wereldtentoonstelling tot Wereldoorlog, Tielt, Lannoo, 2013, 255 pp. Paul Greenhalgh, Fair World: A History of World’s Fairs and Expositions from London to Shanghai 1851-2010, Winterbourne, Papadakis, 2011, 282 pp. Ives Maes, The future of yesterday, Antwerp, Ludion, 2013, 248 pp. 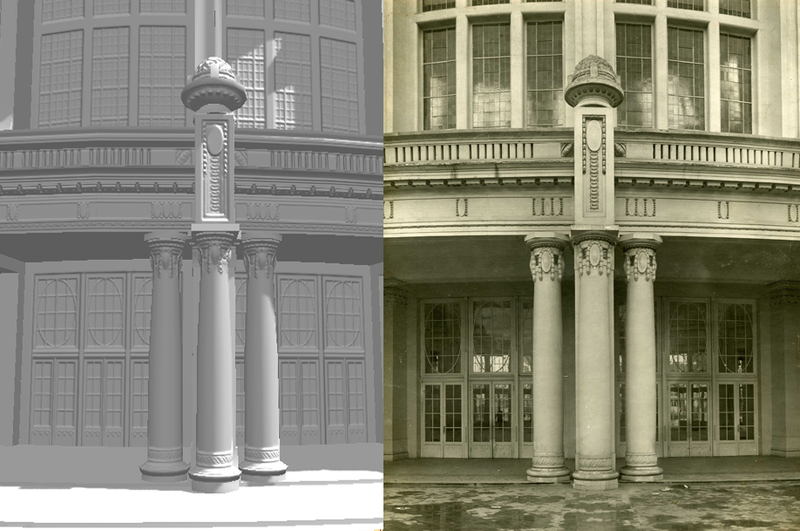 F. Verstraete, A virtual reconstruction of the 1913 World Fair at STAM – Ghent city museum. In Museums and the Web 2013, N. Proctor & R. Cherry (eds). Silver Spring, MD: Museums and the Web. Published May 28, 2014. Consulted .